The world of barbecue is rife with “grate” debates. Gas versus charcoal. Dry ribs versus wet. Then there’s the “corntroversy” over the best way to grill sweet corn, which is in peak season in August: Does it taste better grilled with the husk on or off? Advocates of the husk-on school maintain that grilling corn with the protective green sheath intact protects the tender kernels from the harsh dry heat of the grill. Husk-offers—of which I’m a partisan—point out that corn grilled in the husk merely steams, and is almost indistinguishable from boiled corn. The magic happens when you expose the kernels directly to the fire to caramelize the natural plant sugars and blast the corn with smoke. If you put the debate to a vote elsewhere on Planet Barbecue, I’m certain that husk-offers would win. 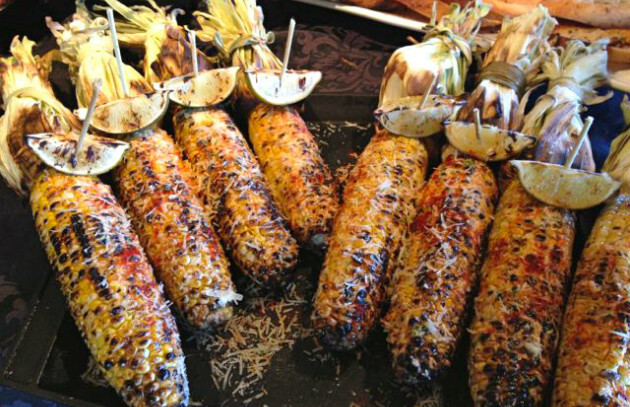 From Mexico to Colombia, from Trinidad to Cambodia, corn is always shucked before grilling. If you’ve always grilled corn with the husk on, I urge you to try it my way. If I can’t convince you, here’s a compromise: grill it “caveman” style—that is, in the husk, but lay the ears directly on the embers of a charcoal or wood fire. Grill it long enough to burn the husk off and brown the kernels, then brush off the ash with a natural bristle pastry brush. Brush with melted butter—come to think of it, this may be the most amazing way of all there is to grill corn. If you do it this way, you’ll want to use corn holders as the corn will be too hot to hold comfortably. You probably know that corn originated in the Americas. You may not know that it’s a member of the grass family. Today, it grows on every continent except Antarctica. On most of Planet Barbecue, corn goes by the name of maize—or something etymologically similar—from the Taíno Indian word mahiz. Yes, this was the same Caribbean tribe that gave us the word barbacoa, origin of our word “barbecue.” Coincidence? I don’t think so. It’s a divine sign that corn was meant to be cooked with live fire. And in late summer, I do it every chance I get. Follow my master recipe for grilling corn (with variations). Get 8 tips for buying and storing corn.